Driving while drugged probably isn’t the best idea, but the people who do it are probably too, ehem, preoccupied at the time to be able to tell us how challenging it really is. In comes Ford, with some new technology showing what it’s like to conduct a vehicle—and catch various balls—while under the influence of drugs. The suit mimics effects of drugs like cocaine, heroin and cannabis, in response to the statistic that 18 percent of driver deaths involve drugs other than alcohol. It’ll be used in the company’s free Driving Skills for Life training program. In other words, road novices will get the chance to experience driving “on drugs” by virtue of headphones playing bizzaro sounds to distract drivers, arm and leg weights, a tremor generator for one hand, and glasses that blur eyesight, create flashing lights and cause tunnel vision. For the drivers in the video, the suit has some pretty intense effects. The professional driver, Tim Gabriel, tries to navigate a few cones on a course and ends up flattening nearly half of them. His poor suit-testing counterpart, Nathalie Klein, can’t even catch a giant exercise ball or walk in a straight line. Though Ford gets credit for dreaming the suit up, it sounds like something people could probably make with random household items. Yes, even the “tremor” part—surely you have one of those hand-shock buzzers that made people hate you as a kid still laying around the house somewhere. That’s an intense tremor, but still. 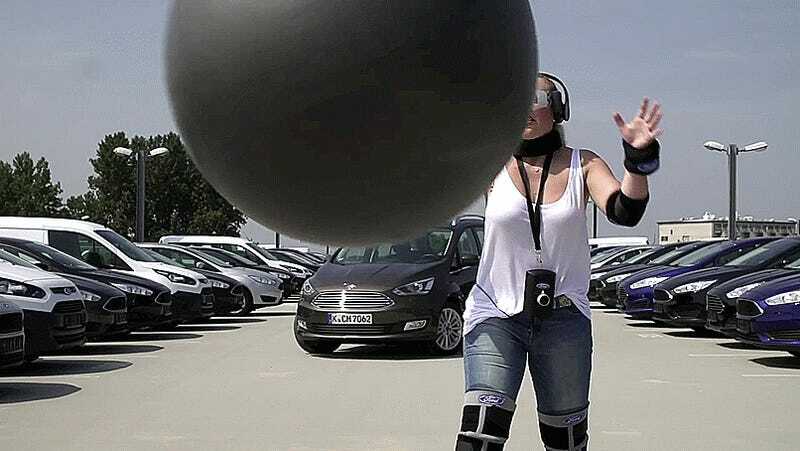 If Ford really wanted to up their game in the car market, they’d be clever enough to make a “Dieselgate Driving Suit” to show the effects of a Volkswagen emissions-filled atmosphere on drivers (that’s a joke). Forget gift cards, it’s off to buy a new car now!